What is conformal coating and why do I need it? - Extreme Telematics Corp.
Electronic controls and sensors for oil and gas are routinely subjected to all kinds of chemicals, moisture from the atmosphere, or other substances that will corrode the circuit board and components. It is only a matter of time before something fails and the product must be repaired or scrapped. One process that can help increase the longevity of electronic devices is the application of conformal coating. Conformal coating is a chemical or polymer that is applied to a circuit board after it is populated and tested. The easiest process involves using a silicone spray. It typically comes in a spray can and is applied to all sides of the board, coating all components. The downside to this type of process is that the application is not necessarily uniform and it can fairly easily be removed. The benefit however is that it is more cost effective to perform repairs because it can be removed. A more reliable process is a UV cured conformal coat, which is what we use on our products. 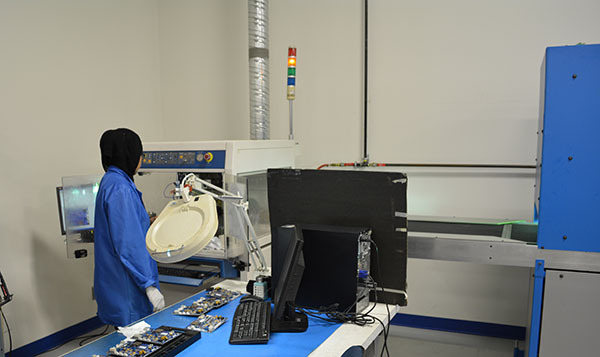 Using an automated process, the circuit boards are sprayed uniformly, then baked in a UV oven. This type of coating is much more durable and will give your devices a much longer life. The downside however is that substantial time and effort is required to rework electronics that have been conformally coated in this manner. Typically the conformal coating much be sand blasted off the components using ground walnut shells. Conformal coating is one of those often overlooked items when it comes to electronic design for the oilfield. If you want products that last is all kinds of harsh environments, then be sure to know what you are getting. Even if the circuit board has been conformally coated, be sure to know which process was used.